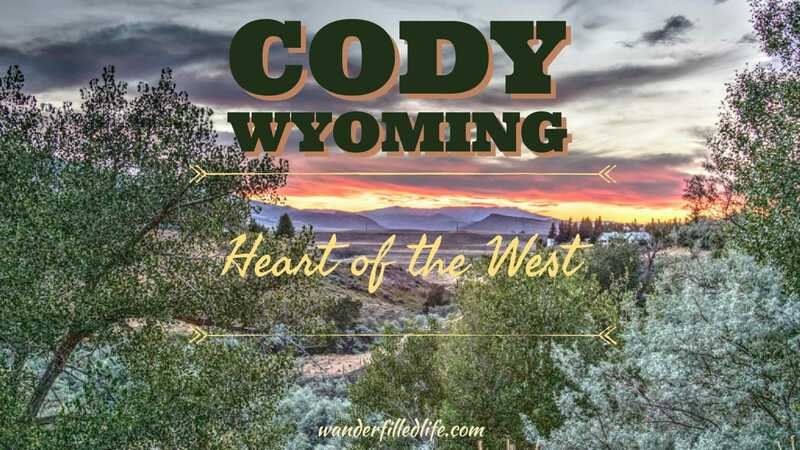 For a lot of folks, Cody, Wyoming is just a stop either coming or going to Yellowstone National Park. It’s a small town with a few red lights, a Wal-Mart and some shops in downtown. At first glance, there’s not much more to Cody than that… But, if you keep your eyes open as you drive through, you will find so much more. We have been to Cody four times and still do not feel like we have seen it all. First, Cody is named after Buffalo Bill Cody, the famous frontiersman from the Old West. Indeed, Buffalo Bill founded the town as an authentic Western town on the outskirts of Yellowstone National Park. He even worked to get a new entrance into the park and paid for it himself. Despite the town’s growth, the downtown area retains its Old West flavor. Downtown Cody has several older buildings, and despite the ever-present gift shops, retains much of its charm. Buffalo Bill Cody constructed he Irma Hotel as the centerpiece of his town in the Rockies. The heart of downtown Cody is the Irma Hotel, built by Buffalo Bill himself and named after his favorite daughter. It remains a good place to get a beer, sit on the covered porch and enjoy the afternoon. You can get a room there as well. They offer historic rooms and contemporary rooms. We stayed there over Christmas 2015 in one of the contemporary rooms, which was comfortable. Be sure to stick around for the daily gunfight. 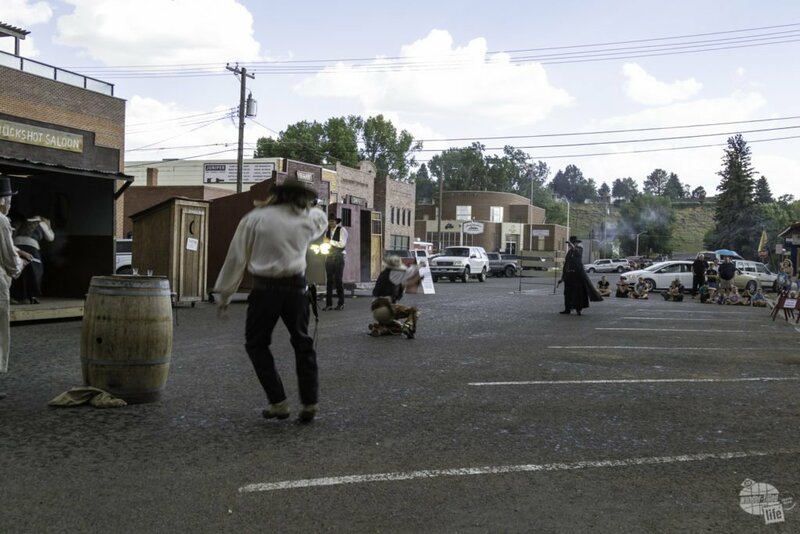 Right in front of the Irma Hotel, there is a daily gunfight enactment for free. Yes, it is community theatre and, yes, it is cheesy, but it is still a bunch of fun. If you want a reserved seat, speak to the folks at the Cody Trolley about getting one. They run $2 and will put you upfront and center for the action. Every afternoon at 6 p.m, there is a shootout at the Irma Hotel. It is free, but you can reserve a chair for two bits… Well, $2. Shops line the streets with plenty of western appeal, along with several bars and restaurants. There are a couple of breweries and a winery/distillery, as well. Leaving out from the Irma Hotel is the Cody Trolley Tours. The tour lasts about an hour and takes you on an incredibly informative tour of the city. We are not normally fans of tours like this, but the tour guides packed it with good information. 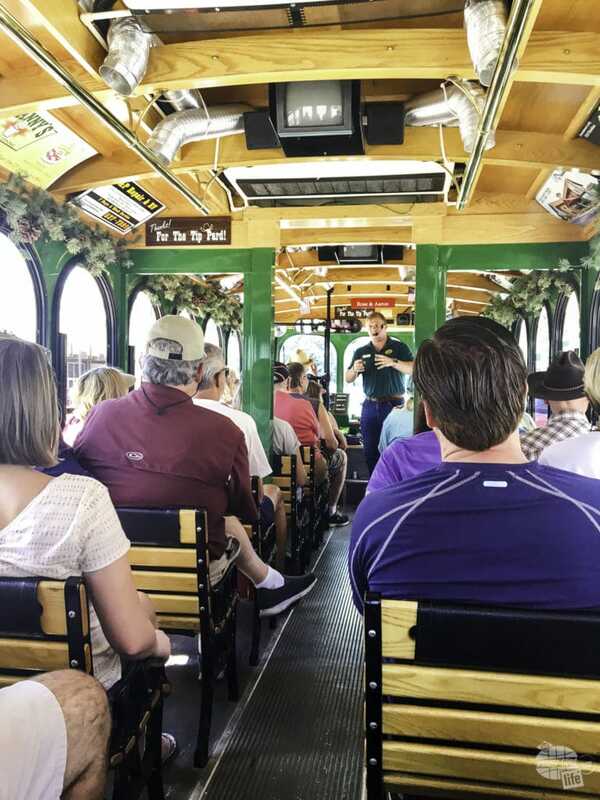 The Cody Trolley Tour was well worth the time and money. Even on our fourth trip to Cody, we learned a lot. 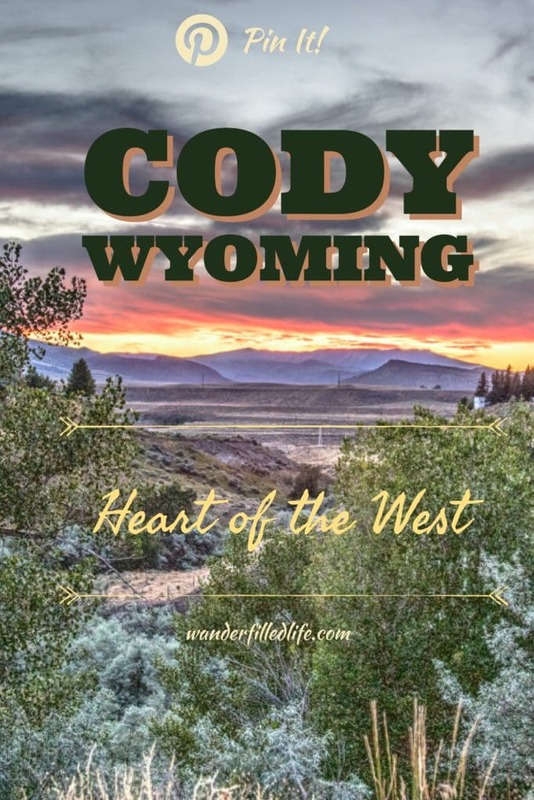 The tour takes you through the history of Cody, showing off the “old” homes remaining in the town… Cody is relatively a young town, so don’t expect amazing old architecture. You should expect a lot of colorful stories about the early days of the town. We learned a lot on the tour and had a lot of fun. Just past downtown is one of the best museums I have ever been to and I have been to a lot of museums. 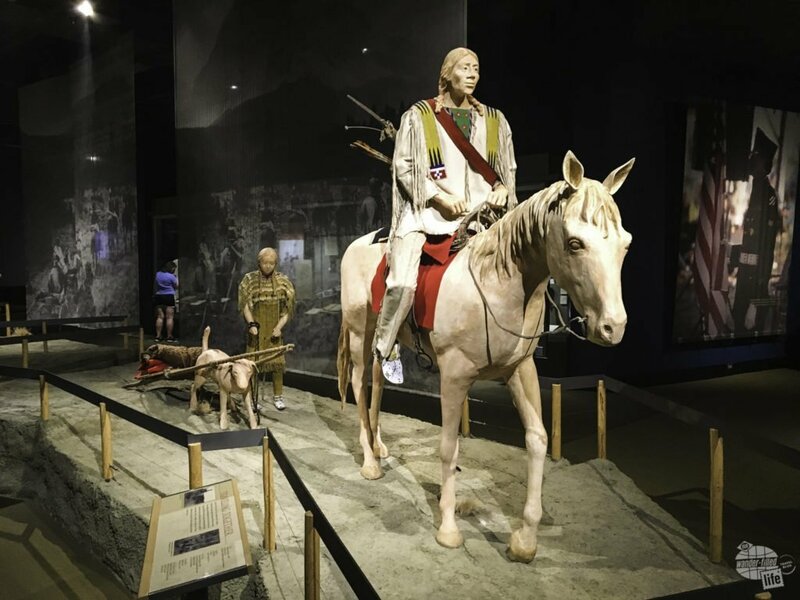 The Buffalo Bill Center of the West is actually five museums in one and you can easily spend days exploring the exhibits. Fortunately, the ticket is good for two days. 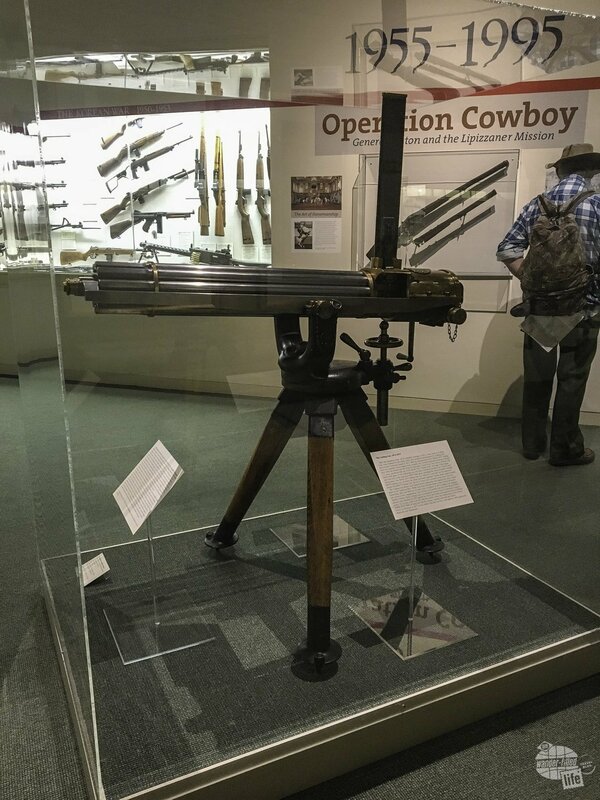 The Cody Firearms Museum, on of five museums in the Buffalo Bill Center of the West, has the most comprehensive collection of firearms in the world. The Cody Firearms Museum has one of the largest collections of firearms in the US, including several oddities, as well as some beautifully decorated firearms. While it is not one of Bonnie’s favorite parts of the center, there are enough weird and cool firearms to keep her interest. The Draper Natural History Museum is a great primer on the greater Yellowstone ecosystem. The museum is great for kids and has several exhibits on wildlife at various altitudes. 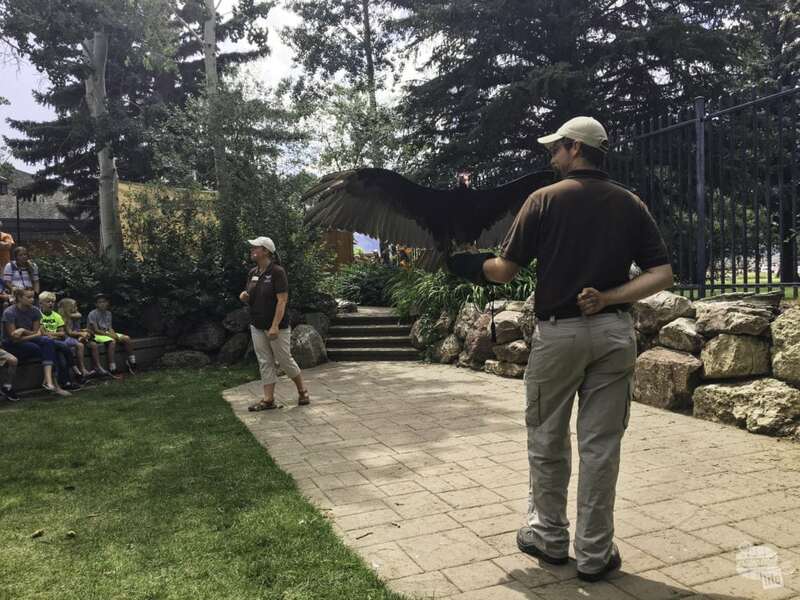 Aside from having outstanding exhibits on the ecosystem of the greater Yellowstone area and Big Horn Basin, the Draper Natural History Museum also gives daily raptor demonstrations. The Draper Natural History Museum also keeps crippled raptors and does live presentations on a daily basis in the summer. We have been to a lot of exhibits on the Plains Indians over the course of our travels through the American West, but the Plains Indian Museum is easily the most complete picture of this lost culture. Again, this is a great portion of the museum for kids. The Plains Indian Museum contains a great number of exhibits which highlight the beauty of this lost way of life. The Whitney Western Art Gallery houses a tremendous collection of art of the American West. While we were there, there was a special exhibit, “That Day,” by the renowned photographer, Laura Wilson, which I particularly enjoyed. Lastly, there is an entire wing of the center dedicated to the life of the Buffalo Bill himself, detailing his life, his family and his accomplishments. If you keep on heading through town towards Yellowstone, you will come across a true gem: Old Trail Town. At first glance, Old Trail Town seems like a tourist trap, but when you realize none of the houses are reconstructions and a nonprofit maintains the town, it becomes very apparent this is a historic treasure. At first, Old Trail Town feels like a tourist trap. Once you realize none of the buildings are reproductions and it is a run by a local non-profit, it becomes a historical treasure. 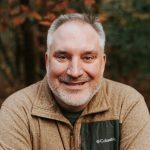 Here you will find authentic cabins, like three different buildings associated with Butch Cassidy’s and the Sundance Kid’s Hole in the Wall Gang. 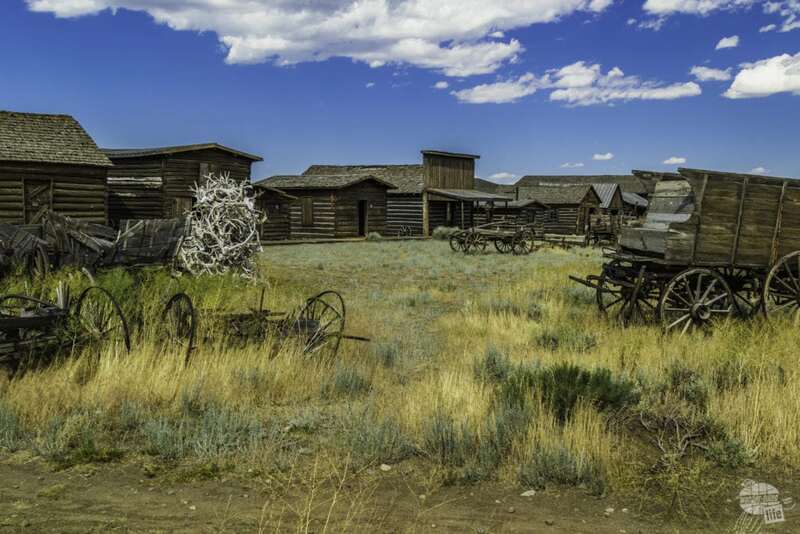 You will also find saloons from old frontier towns and artifacts held within. 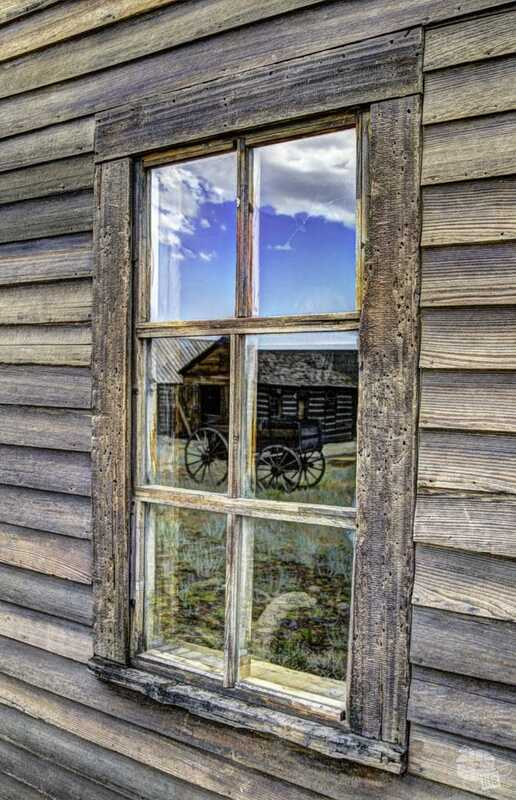 The lead glass windows at Old Trail Town reflect on the real Old West. The amount of truly authentic Western history found inside the buildings, not to mention the buildings themselves, really impressed me. About 20 minutes east outside of Cody headed towards Powell, is another bit of history no one should miss: the Heart Mountain interment camp. Heart Mountain was a Japanese interment camp during World War II and, for a time, was one of the largest communities in Wyoming. Like the National Historic Sites of Minidoka in Idaho or Manzanar in California, this site tells the story of Japanese-Americans the government uprooted from their homes on the West Coast. The government relocated them inland to various camps. One of the guard towers built to keep an eye on the incarcerated Japanese at Heart Mountain. 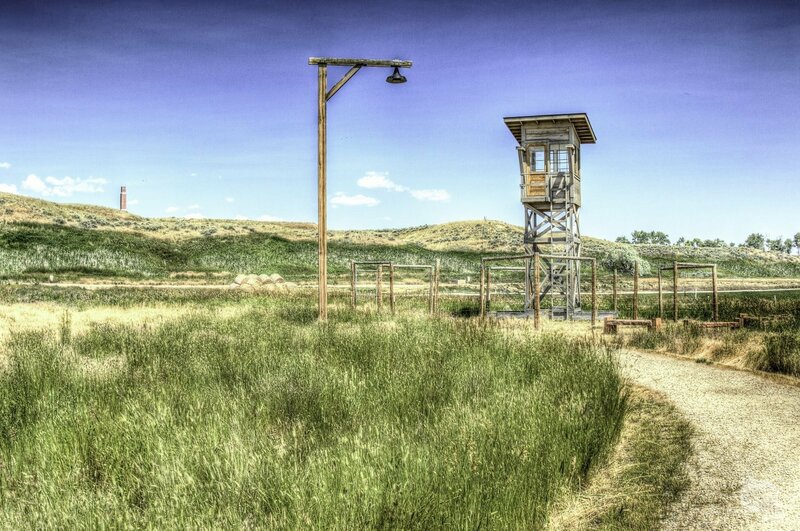 What makes Heart Mountain different is the museum and memorial was erected by folks who were incarcerated at Heart Mountain. The narrative told here is one of a people forced to give up everything they owned, as well as their freedom, and then be subject to the draft. It is both sobering and eye-opening. Bonnie and I have been to the Oskar Schindler Factory in Krakow and the camps in Auschwitz. The parallels of how the US government treated Japanese-Americans versus the treatment of the Jews is evident. In particular, the posted notices are eerily similar. 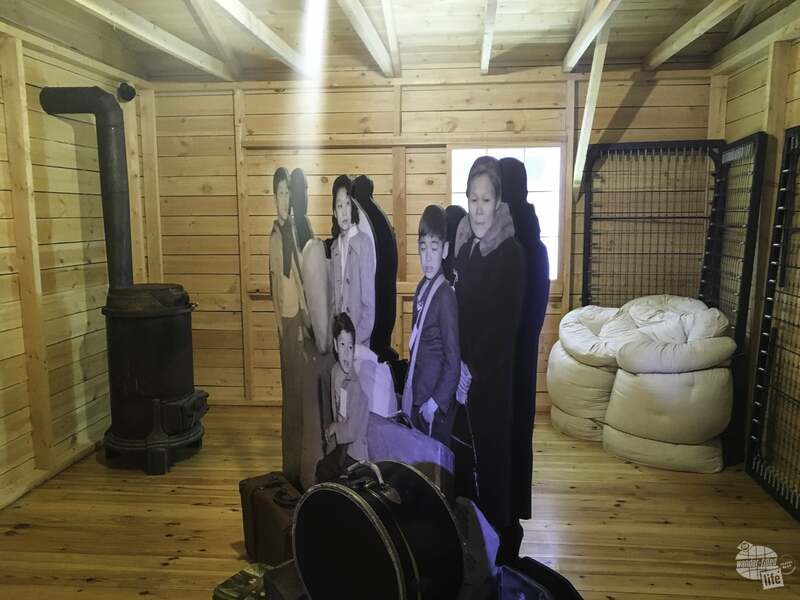 This exhibit at Heart Mountain demonstrates the conditions found by the Japanese-Americans incarcerated there during World War II. Heart Mountain really impressed me with the quality of the presentation. I have not been to Manzanar National Historic Site, but this was much more comprehensive than what we found at Minidoka National Historic Site. This is one visit everyone should make while in Cody. It is incredibly important the lessons of these camps not be forgotten. Never again. I could not imagine feeling more welcome in a hometown 4th of July celebration than at Cody’s. It started off with a parade (they have one on the 3rd, too), which led into a festival in the city park with live music, food trucks and plenty of vendors. There is nothing like rodeo dandies in a Fourth of July parade to remind you of being in the West. We got some barbecue, perused the shops, then headed over to the Buffalo Bill Center of the West for a real treat: a book signing. 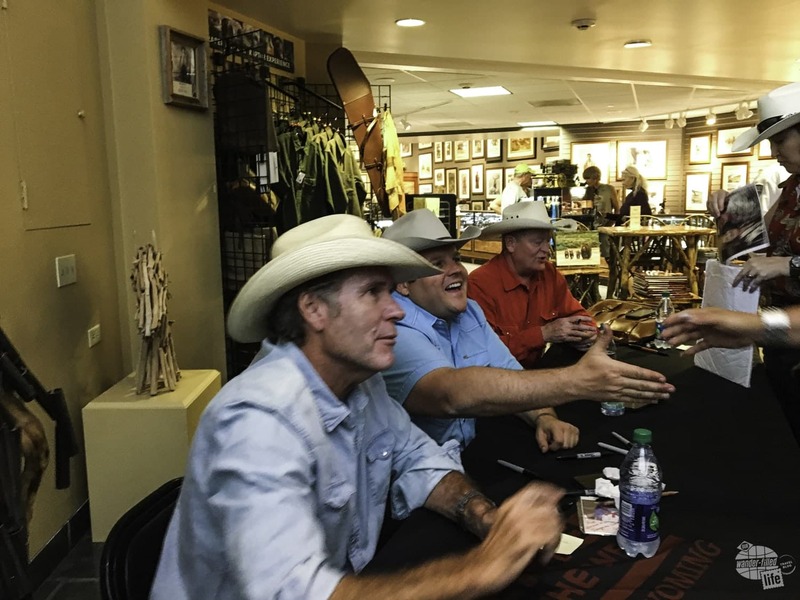 Craig Johnson, author of the Walt Longmire Mysteries, (far end of the table), Adam Bartley, who plays Deputy Ferg (middle) and Robert Taylor, who plays Walt Longmire (in the front) doing a book signing at the Buffalo Bill Center of the West in Cody. We were able to enjoy some of the museum before headed to the rodeo. Most nights, the rodeo starts at 8 p.m., but to accommodate the fireworks, the organizers push it up to 5 p.m. on July 4. Convenience and location are the best parts of staying at the Ponderosa Campground in Cody. Not only is the campground a stop for the trolley and rodeo bus, but the cliffs in the back are a great spot for watching fireworks. After the rodeo, we grabbed our lawn chairs and grabbed a spot to watch fireworks. 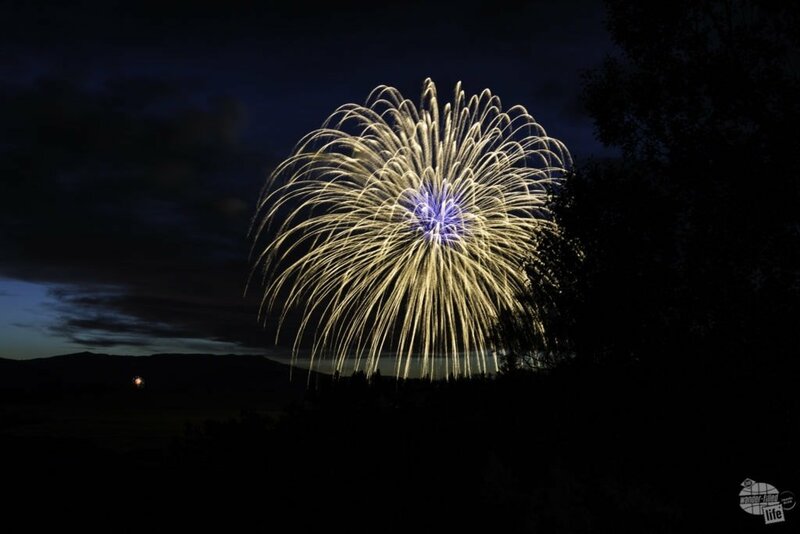 The Ponderosa Campground in Cody affords a great spot to watch fireworks on the Fourth of July. 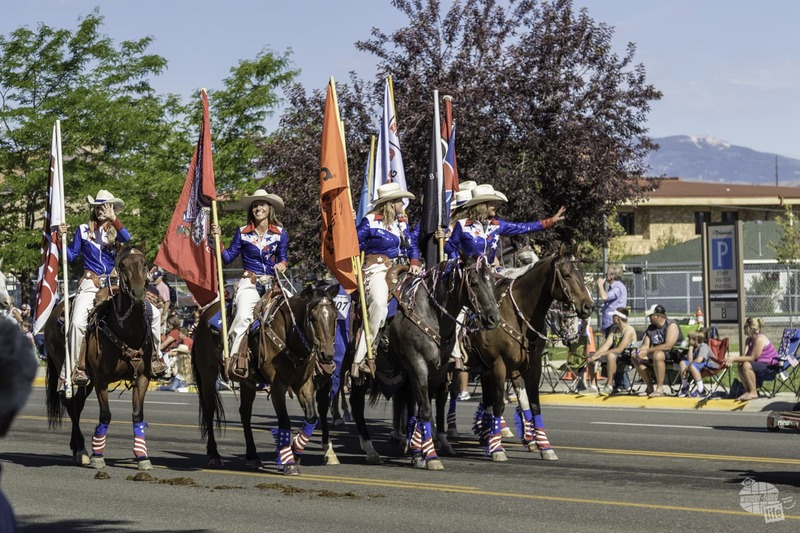 Parade, festival, rodeo and fireworks… We can’t think of a better way to spend the 4th of July. It never fails. We always seem to be in Cody on July 2, which is “Tuff Enough to Wear Pink” night at the Cody Stampede in support of the fight against breast cancer. This is our fourth visit to Cody and our third trip to the rodeo. I have been to plenty of rodeos in my life and I have never been to anything like the Cody Stampede. There is so much passion, so much love for rodeo, and as well there should be. 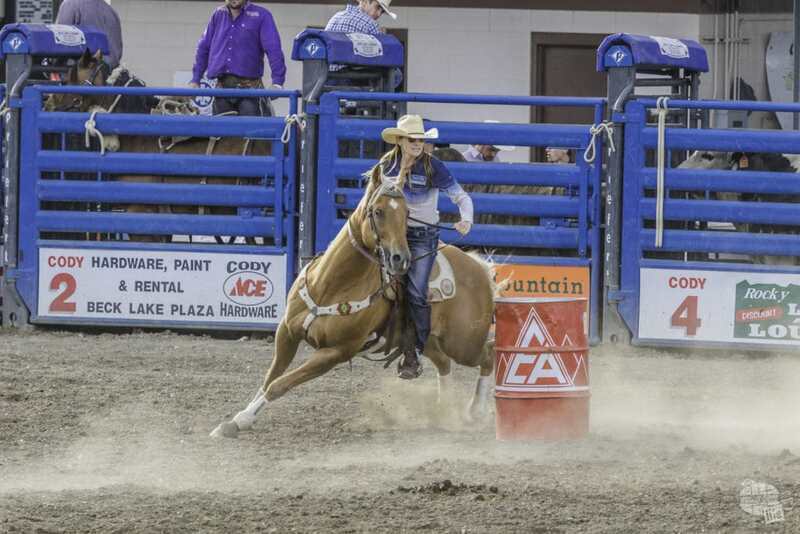 “Cody is Rodeo” is the town’s slogan and it proves it in the summer. The bulls bucked most of the bull riders on the final night of the Cody Stampede. Indeed, it does not matter what night you come in the summer, there’s rodeo at the Cody Nite Rodeo. The days leading up to the Fourth of July are special, however. 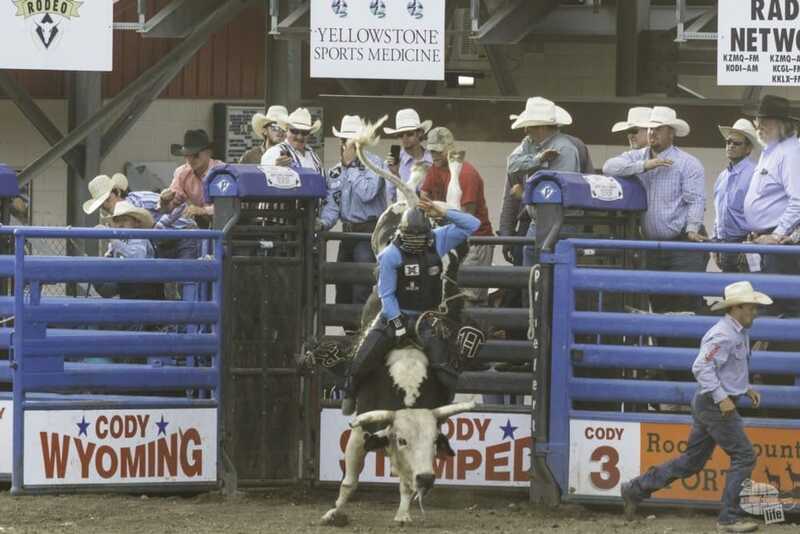 It’s time for the Cody Stampede, when the best of the rodeo world descend on Cody for five days. It starts with Xtreme Bulls on June 30 and finishes on the Fourth of July. It’s as Western as you can get. Sitting under the Wyoming night sky, cowboys, cowgirls and rodeo royalty parade across the dirt. They compete in a series of contests. The difference between walking away with prize money is hundredths of a second. I (Grant) am a big fan of barrel racing because of the amount of teamwork it takes between rider and horse. Fractions of a second separate those who place and those who go home empty-handed. If you have never been to a rodeo, there is no better place on earth to see it in all its glory. It keeps its small town feel, while hosting a world-class competition. As I have said, this was our fourth trip to Cody. I’m sure it won’t be our last. 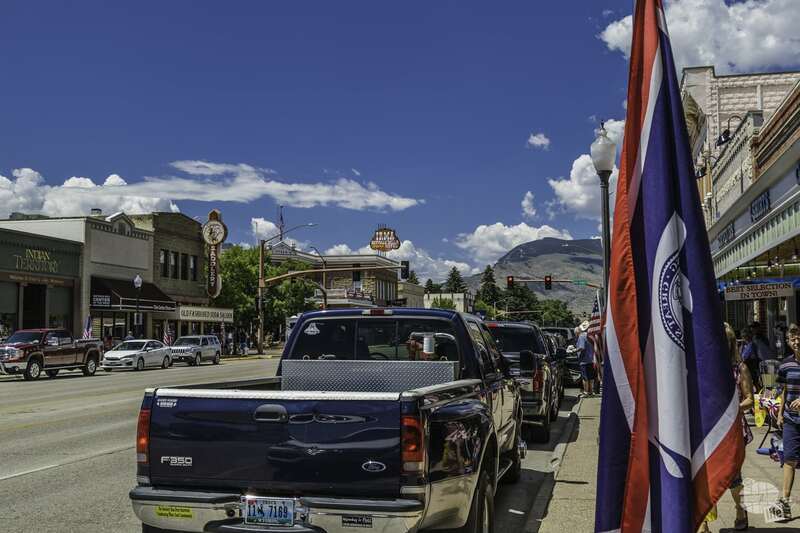 This town has so much to offer beyond the stuff we got to see this trip, like the Buffalo Bill Reservoir, rafting on the Shoshone River, the Cody Firearms Experience, where you can fire a late 1800s Gatling gun, among other historic firearms, and other experiences both in and outside. Most folks view Cody as a stop on the way to or from Yellowstone, but it was recently featured as one of the top 55 small towns to visit on a road trip. That said, there is stuff to see to keep folks busy for several days. The best part about Cody is its authenticity. This is the beating heart of the West. For more information, be sure to check out YellowstoneCountry.org. Hi! Grant, Thank you for the great blog on Cody, Wyoming! Sounds like a place I would love to visit.